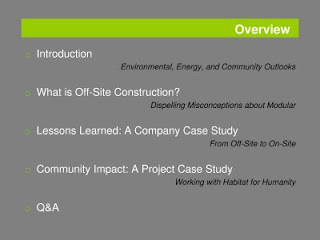 One of my tasks at my internship, among loads of other things, was to take on the job of coordinating and moderating (and eventually trouble-shooting) a Green Development Center webcast. Now...I've given plenty of presentations within an academic context, but not many in the professional world, and a total of zero web-based ones. This was new territory, but it's been a cool experience learning in the last couple months about the process of developing one and just researching and getting educated on the topic itself. 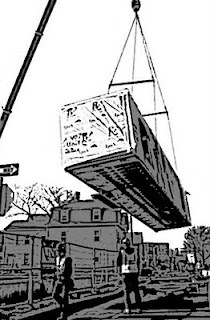 I've heard about off-site (or modular) cnstruction a little bit, but just imagined cranes swinging boxes in the air - very cookie cutter building and not very interesting. However, after chatting quite a bit with the panelists, who are all experts in the field, I soon realized that there was a lot more to it. 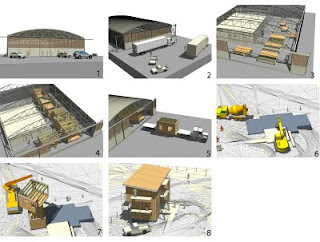 It means that buildings can still be customized, but instead of constructing it directly in the site ("stick building"), it's fabricated in the controlled environment of a factory and then shipped and placed with a crane. The regulated atmosphere doesn't automate the process necessarily (not a conveyor belt, but still people doing the work), but it makes it faster, often cleaner, and more integrated of a process. Then...take 2 months' worth of research, conference calls, and ta-da! The hour and a half went well yesterday, despite some technical hiccups. Wahoo - that's one big project done. The making of a good Powerpoint is KEY - and I was shocked at how many presentations (not necessarily those of the presenters, but just in general) were just..not...very...good. And they're being shown in very professional settings, so I guess I've taken for granted, being in the design world, how important aesthetics and just plain readability are in getting your point across. 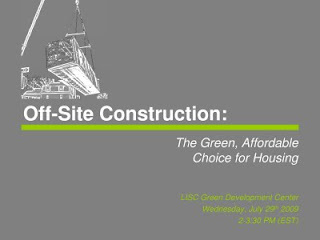 Off-site construction and other systems-based building techniques aren't taught at all in school. I suppose they border on the building science side of things, which has a weird role in academia. One of the panelists seemed gung-ho about me bringing this back to the classroom realm...but we'll see what happens. Coordinating 3 busy people for a slew of conference calls and meetings, across time zones nonetheless, is a little stressful. To say the least. We got through it, though, and I was pleasantly surprised - and grateful - how, despite the many reschedules, these professionals were really flexible and willing to put the effort into this presentation even though it was a voluntary effort. Technology: love it, hate it, can't live without it.